Rehabilitation is a complex, dynamic process, aimed at providing co-ordinated services to help overcome or reduce disability, following illness or injury. Peamount Healthcare’s Respiratory Rehabilitation Service investigates and treats respiratory disorders in adults. The Service treats conditions such as chronic lung disease, asthma and sleep disorders. This involves the assessment, diagnosis and treatment of patients’ symptoms including education in managing their condition, diet and smoking cessation. The Service facilitates independent living, reduced hospital admissions and an improved quality of life for its clients. The 25 bed unit provides specialist in-patient care for Asthma; Chronic Obstructive Pulmonary Disease (Chronic Bronchitis/ Emphysema), including Pulmonary Fibrosis, Sleep Problems (Obstructive Sleep Apnoea), respiratory problems associated with Neuro Muscular Disorders, Chronic Hypoventilatory Respiratory Failure (CHRF) and chronic lung infections such as Bronchectesis. The Respiratory out-patient department has 5 clinics each week for Sleep Investigations, Chronic Obstructive Pulmonary Disease, Asthma and Allergies, Condition Management and Smoking Cessation. Support services include Chest X- Rays, Pulmonary Function Tests (Breathing Tests), Respiratory Muscle Weakness Assessment, Oxygen Assessment, Full Polysomnography (Overnight Sleep Assessment), Arterial Blood Gases and TOSCA/Oximetry (Monitoring Oxygen/ Carbon Dioxide Levels). Conducted by the Physiotherapy Department with input from the Multi-Disciplinary Team, groups of between 6 and 8 patients are invited to attend two to three classes per week for eight weeks to reduce breathlessness through improved exercise tolerance. The service is provided by a Multidisciplinary Team that includes Doctors, Nursing, Physiotherapists, Occupational Therapists, Social Workers, Speech and Language Therapists, Pulmonary Function Technician, Pharmacist, Radiologist and Dietician. In-patients are transferred directly from acute General Hospital once their condition is stable for continuation of care. GPs refer patients directly to the out-patient clinics for investigation or management of any respiratory problem. 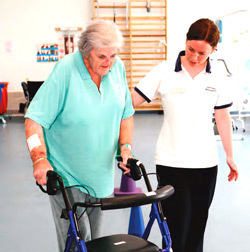 Peamount Healthcare’s Age Related Rehabilitation Service offers an in-patient rehabilitation programme to adults over 65 who have had a loss of independence due to injury or illness, such as stroke, musculoskeletal disorders and orthopaedics. Over three quarters of patients of this Service return home usually after a short stay. However due to their condition some people may not be able to return home and may be transferred to their referring hospital. The Service accepts adults predominantly over 65 from all general hospitals but mainly from AMNCH Hospital (Tallaght). Younger people may be considered depending on their clinical needs. The Service has a 25 bed in-patient unit on the Peamount campus. Patients are admitted under a Consultant Geriatrician, and a Care Plan is developed based on their needs. Nurses, Health Care Attendants and Clinical Nurse Specialists work together to deliver dedicated care and support. Patients are supported on a referral basis by Physiotherapists, Occupational Therapists, Speech and Language Therapists, Medical Social Workers, Dieticians and a Consultant in Psychiatry of Later Life. Referrals to this Service are accepted based on the likelihood they will benefit from rehabilitation and be suitable for admission. They must consent to rehabilitation and express a willingness and motivation to participate. Referrals are only accepted from a Consultant Geriatrician.